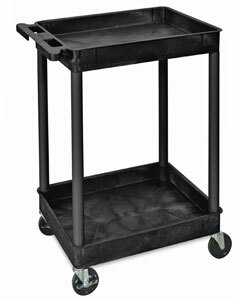 Luxor Heavy-Duty Utility Carts are ready to roll with an integrated push handle molded into the top shelf. Easy-moving, quiet, 4" casters (two locking) let you wheel tools and supplies anywhere you need them. These tough carts will not stain, scratch, dent, or peel. Choose from various models featuring tub-style shelves (2¾" deep) or a combination of flat and tub-style shelves. Luxor Heavy-Duty Utility Carts are backed by the manufacturer's lifetime warranty. Simple assembly is required. Combo Three-Shelf Cart — This cart features a flat upper shelf with the two tub-style shelves below. It measures 40½"H × 24"W × 18"D (103 cm × 61 cm × 46cm) overall. Three-Shelf Cart — This cart features three tub-style shelves and measures 40½"H × 24"W × 18"D (103 cm × 61 cm × 46 cm) overall. Two-Shelf Cart — This cart features two tub-style shelves and measures 36"H × 24"W × 18"D (91 cm × 61 cm × 46 cm) overall.